Self-service access control rules define the operations that an entity can perform on itself. These rules define only what attributes a user (or other IdM entity) can edit on their personal entries. A rule for editing some general attributes in the personal entry, including given name and surname, phone numbers, and addresses. A rule to edit personal passwords, including two Samba passwords, the Kerberos password, and the general user password. A rule to manage personal SSH keys. 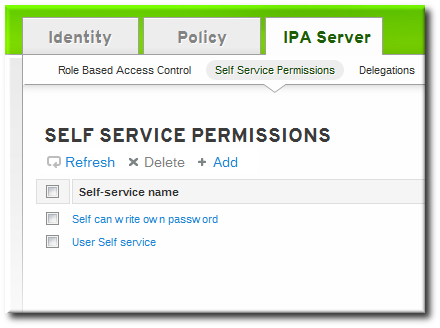 Open the IPA Server tab in the top menu, and select the Self Service Permissions subtab. Click the Add link at the top of the list of self-service ACIs. Enter the name of the rule in the pop-up window. Spaces are allowed. Select the checkboxes by the attributes which this ACI will permit users to edit. Click the Add button to save the new self-service ACI. A new self-service rule can be added using the selfservice-add command. There are two required options, --permissions to set whether the ACI grants write, add, or delete permission and --attrs to give the full list of attributes which this ACI grants permission to. 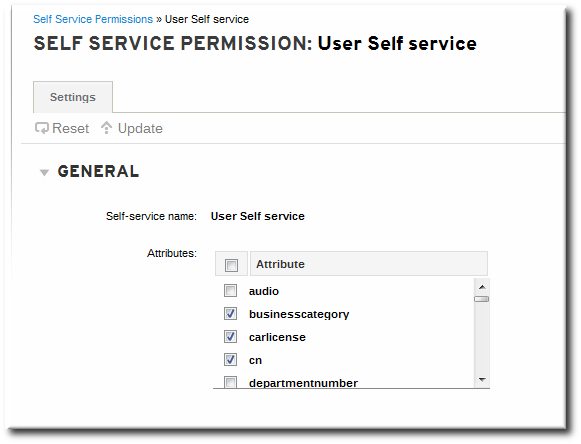 Added selfservice "Users can manage their own name details"
In the self-service entry in the web UI, the only element that can be edited is the list of attributes that are included in the ACI. The checkboxes can be selected or deselected. With the command line, self-service rules are edited using the ipa selfservice-mod command. The --attrs option overwrites whatever the previous list of supported attributes was, so always include the complete list of attributes along with any new attributes. 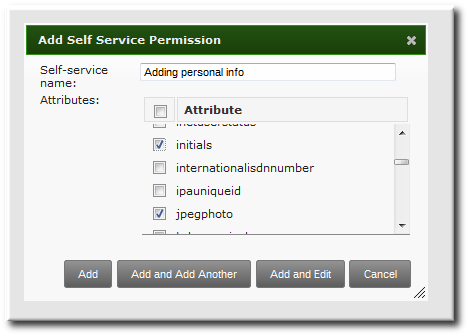 Modified selfservice "Users can manage their own name details"
Include all of the attributes when modifying a self-service rule, including existing ones.